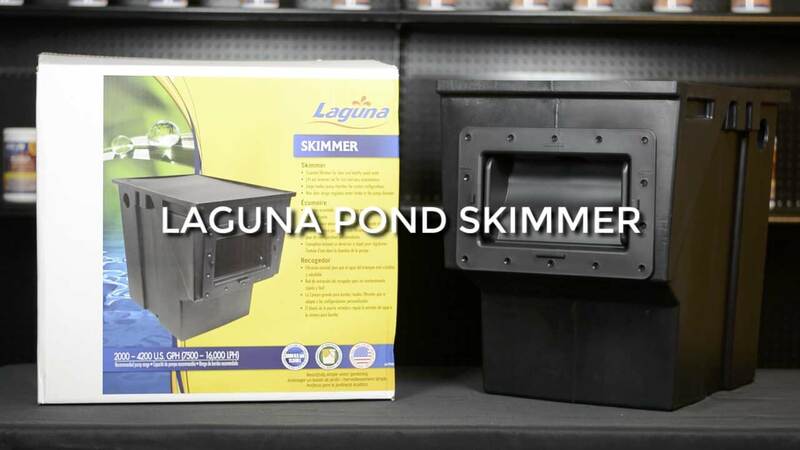 Review: Laguna Pond Skimmer The Laguna Pond Skimmer easily removes leaves and surface debris from your pond. Skimmers are some of the most effective methods of removing leaves and surface debris from a pond. Also, since the pump is generally installed inside the skimmer, it provides a protected location for the pump - making removing and cleaning the pump that much easier. This video won't go into installation, but rather the specific internals and its specific function and mechanics. This unit can handle ponds up to 3,000 gallons. A wide 9inch. weir allows for pumps with a flow-rate up to 4,200 GPH. Removing the lid, you can see the overall layout. The pump sits on the backside and the connected tubing runs out the opening. This opening is above water level so there's no need for a bulkhead fitting. As the water enters the first level it hits is a leaf net. This will trap any leaves and other large debris. Behind the leaf net are a series of filter brushes. These will serve as bio-mechanical pre-filtration. Not only trapping debris but, they will also accumulate bacterial growth as well. With its rugged construction, the Laguna Skimmer is made to last while providing easy maintenance.